If you've spent the past 13 seasons of Supernatural waiting for The Winchester Brothers (Jared Padalecki and Jensen Ackles) to be turned into animated characters, your long wait is coming to an end with the Supernatural and Scooby-Doo crossover. Following the first-look photos that surfaced yesterday, The CW Network has released the first trailer for this ScoobyNatural crossover, which is slated to debut Thursday, March 29 at 8 PM ET. This trailer not only offers the first footage from this crossover, but reveals how the Winchesters become animated in the first place. The trailer starts with the Winchester Brothers as their usual, human selves, but when they try to turn on the television, they get sucked into it, and realize that they are now cartoons. It doesn't take them too long to find the animated version of their iconic Chevy Impala, and when they come across a local diner and find the Mystery Machine van parked outside, the Winchester Brothers realize that they have been sucked inside Scooby-Doo. Sure enough, upon entering the diner, they find Scooby-Doo sucking down some milkshakes while Fred, Shaggy, Velma and Daphne are all dancing to the jukebox. The trailer ends with Dean telling Sam that he has "dibs" on Daphne, with the final shot of the trailer showing Dean kissing Daphne's hand. While he is nowhere to be seen in this trailer, we got our first glimpse at an animated Castiel (Misha Collins) in the photos that surfaced yesterday. 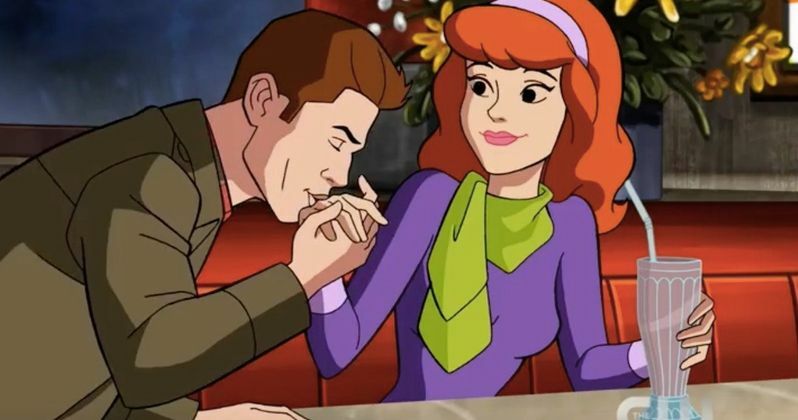 The CW has also released a brief synopsis for the crossover episode, which reveals that Sam, Dean and Castiel "are transported into the animated world of Scooby Doo where they join forces with the Scooby gang to solve a ghostly mystery." The episode is directed by Robert Singer and written by Jim Krieg and Jeremy Adams. Executive producer/director Robert Singer revealed in yesterday's report that, when Sam and Dean realize they're stuck in a Scooby-Doo, it's incredibly exciting for Dean because it was his favorite show growing up. Dean is such a big fan that he even recognizes the exact episode they have been transported to, a 1970 episode of Scooby-Doo, Where Are You! entitled A Night of Fright Is No Delight. However, this isn't a simple "repeat" episode, since there is a massive monster that needs to be taken down, with Singer adding that the episode does, "get pretty dark" adding that there are elements that fans wouldn't see in a typical Scooby-Doo cartoon. As for the Scooby-Doo characters, there is no indication as to who will be voicing them at this time, but this isn't the first time Scooby-Doo has crossed over with a well-known franchise. Back in January, Warner Bros. released the straight-to-video animated movie Scooby-Doo & Batman: The Brave and the Bold, which featured Frank Welker voicing both Scooby-Doo and Fred Jones, Matthew Lillard as Shaggy, Grey DeLisle as Daphne and Kate Micucci as Velma. While it's possible that this same lineup could voice the Scooby-Doo characters in this crossover, that has yet to be confirmed. Take a look at this new Supernatural animated crossover trailer below, courtesy of The CW YouTube.